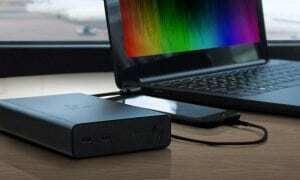 I know I’ve said this before, but wireless chargers really are a dime a dozen. Fonesalesman, based out of the UK, aims to stand apart from the crowd with their WoodPuck: Bamboo Edition Qi Wireless Charger Pad. 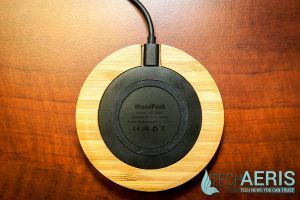 They were kind enough to send one over to us, so lets take a look in our WoodPuck Wireless Charger review. Simply put, this is one good looking wireless charger. 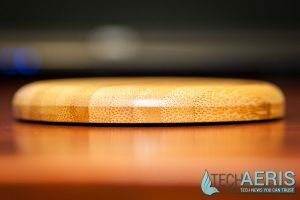 The WoodPuck is created using Mao Zhu Bamboo that is hand picked resulting in a somewhat unique wood grain finish to each charger. At a glance, this wireless charger looks like a coaster. 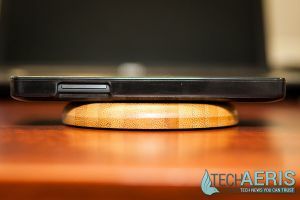 It’s nice and smooth as well, and not that thick (around 1cm which is less than 1/2″) considering it has a layer of bamboo over the Qi wireless charging internals. The micro-USB socket & plug are nicely hidden out the back and underneath the bamboo surface, allowing the WoodPuck to compliment your office or home. 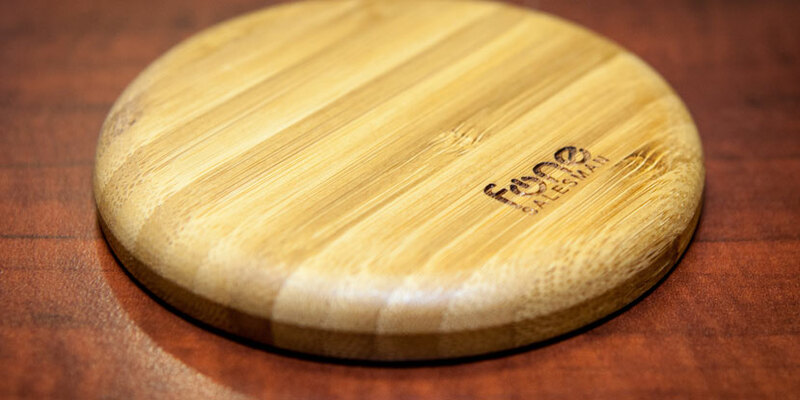 The charger is very light (weighing in at only 80g), and being made out of bamboo it should resist dings and scratches better than other types of wood. 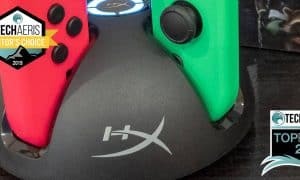 The charger also features a rubberized ring on the bottom to prevent it from sliding around when you place your phone on it. The WoodPuck works well, the USB cable fits in snugly to the micro-USB socket. 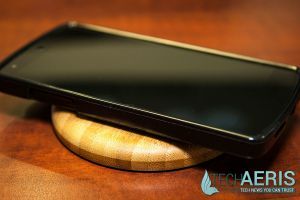 As with all Qi wireless chargers, charging isn’t as quick as plugging your device into the wall, but it definitely felt on par with other wireless chargers I’ve used. 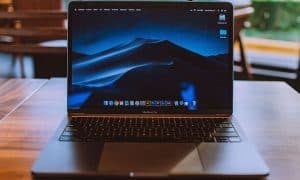 The charger doesn’t have any lights to indicate it’s charging, but it does make an audible beep when you place your phone on it and it starts to charge your device which is a nice touch. 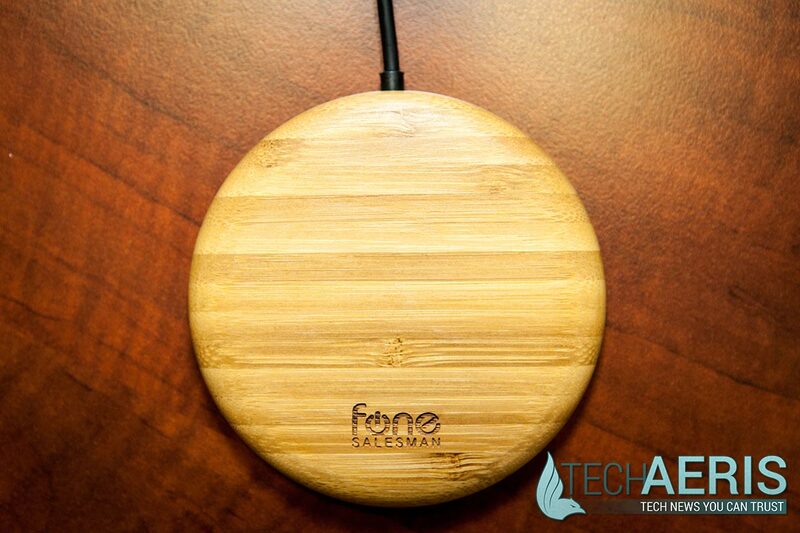 The bamboo also dissipates the heat generally associated with wireless chargers nicely, and even has what Fonesalesman calls Poor Sync Detection which prevents any excess heat. 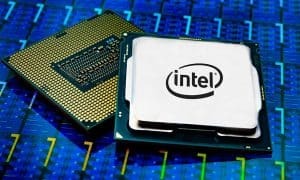 The audible beep will also sound if your device is inefficiently placed. 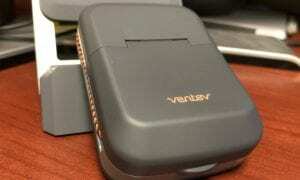 The charger works great and I had no issues using it with my Nexus 5 housed in a Caseology TPU case. If you look on the Fonesalesman site, the WoodPuck will set you back £39.99/$61.79USD. 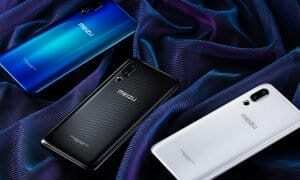 At that price I’d be hesitant to say it would be a good value just to have a nicer looking Qi charger around. 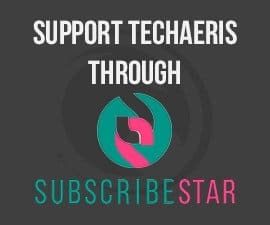 However, and as is usually the case, the WoodPuck is also available on sale through Amazon and will only set you back $30. 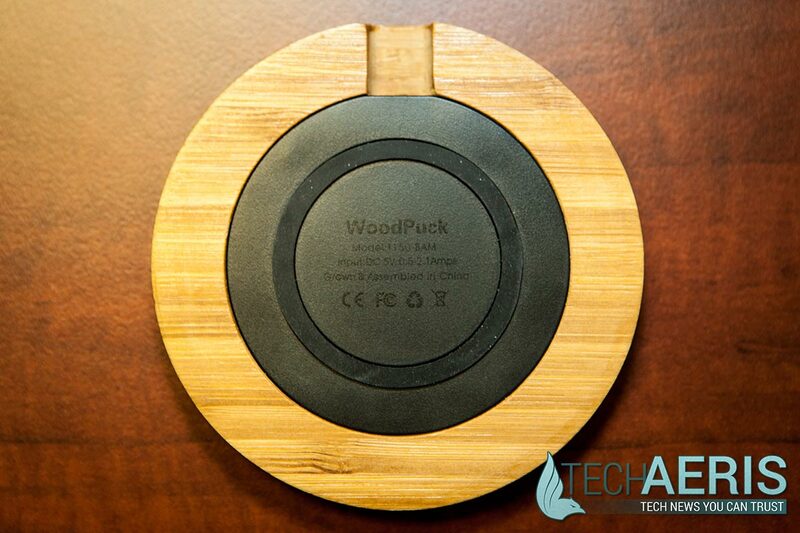 The WoodPuck Bamboo Charger Pad is a great looking Qi wireless charging device. 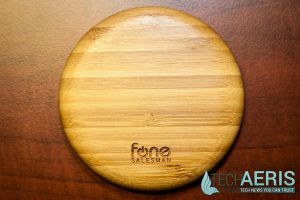 If you’re looking for a wireless charger for the office or are after a charger that’s more pleasant to look at around the house, you can’t go wrong with this charger from Fonesalesman. 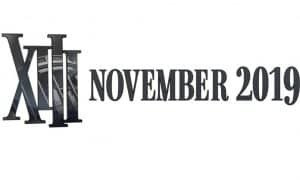 Some people might not like the logo on the front but it still looks slick. 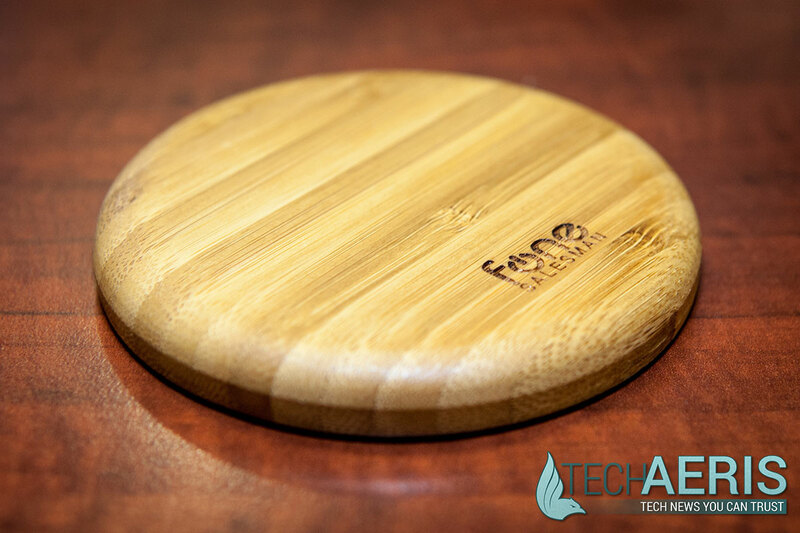 The WoodPuck Bamboo Charger Pad is a very good looking Qi wireless charging device. 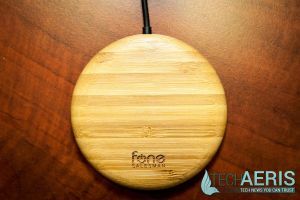 If you're looking for a wireless charger for the office or are after a charger that's more pleasant to look at around the house, you can't go wrong with this charger from Fonesalesman. *We were sent a review unit of the WoodPuck: Bamboo Edition Qi Wireless Charger Pad for the purposes of this review.